Godolphin’s Line of Duty (IRE) used a strong late move to propel him to a half-length triumph in the $1 million Breeders’ Cup Juvenile Turf (G1) on November 2, 2018 at Churchill Downs. 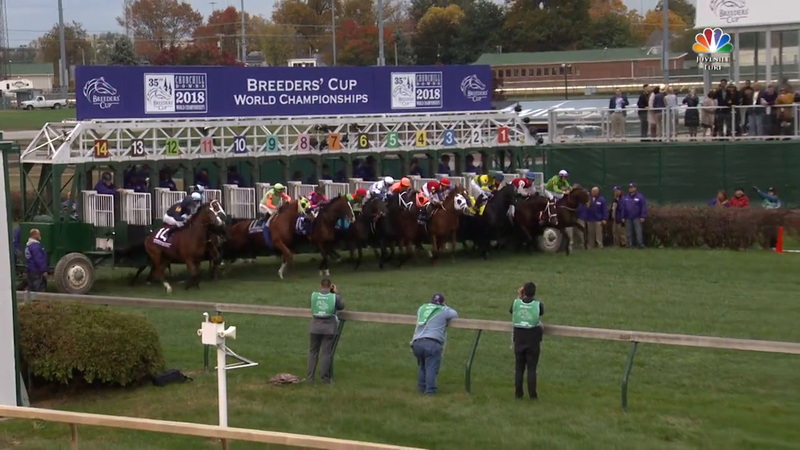 But before victory celebrations could commence at the 35th Breeders’ Cup World Championships, his connections had to wait out a stewards’ inquiry into possible interference. Line of Duty, a son of Galileo (IRE) ridden by William Buick for trainer Charlie Appleby, uncoiled a swift outside run late and prevailed in a three-way finish while completing the one-mile race for 2-year-old males in 1:40.06 on yielding turf. Uncle Benny’s rider, Irad Ortiz Jr., lodged an objection following the race, but after a review the stewards let the result stand. The winner and runner-up, both closers with aim on pacesetter Somelikeithotbrown, were involved in two incidents. The first happened as the field neared the quarter pole when Uncle Benny was gaining on the inside and Ortiz had to steady as Line of Duty also was advancing. Into the stretch Buick moved his mount off the hedge to launch a torrid outside rally, but after Uncle Benny split horses and ranged up on Somelikeithotbrown, Line of Duty drifted left under Buick’s right-handed urging and again bumped Uncle Benny to his inside just before surging to the win. Uncle Benny finished a neck ahead of third-place finisher and pacesetter Somelikeithotbrown. Appleby enjoyed his second Juvenile Turf winner following Outstrip in 2013 and his third Breeders’ Cup win overall. Line of Duty has three wins and two seconds from five starts in his 2018 campaign. After a pair of runner-up finishes to begin his career, he broke his maiden at Goodwood and went on to France to win the Prix Conde (G3) in October in his start prior to the Juvenile Turf.